You can download the Excel sheet here. Paypal is $30/month plus $0.30 + 2.9%/transaction for sales of $0 to $3,000; $0.30 + 2.5% for sales of $3,000 to $10,000; and $0.30 + $2.2% for sales of $10,000+ (source). For example, if I have 100 customers who are paying $8/mo, my monthly Paypal expenses are $30 + ($0.30 + 0.029 * $8) * 100 = $83.20. Recurly is $29/month plus $0.20/transaction for up to 200 transactions/mo; $69 + $0.10/transaction for up to 500 transactions; and $199 + $0.09/transaction for up to 2,250 transactions/mo (source). (Note that if you’re not billing monthly, it becomes a bit more complicated because they also look at how many users you have in addition to the number of transactions — see their pricing page for more info.) So for 100 customers–assuming 1 transaction/mo/customer–Recurly expenses are $29 + $0.20 * 100 = $49. Total monthly expenses for Paypal Pro + Recurly = $132.20. Total monthly revenue for 100 customers at $8/customer = $800. Total profit = $800 – $132.20 = $667.80. In this example, 16.5% of the revenue would go towards payment processing. Speedly is a flat $19/mo + $0.20/transaction. For 100 customer, that works out to be $39/mo. For Paypal Website Payments Pro and Spreedly the total is $83.20 + $39, or $122.20, or 15.2% of the revenue. These numbers will vary a bit based on the rates you get on your merchant account. These calculations assume a $0.25/transaction fee, a $9.95/mo monthly statement fee, a 2.19% Vista/Mastercard discount rate, and a $25 monthly minimum. Authorize.net is $20 + $0.10/transaction (source). For 100 customers, the monthly cost would be $20 + $0.10 * 100 = $30. For the merchant account, the fees would total $9.95 + $0.25 * 100 + 2.19% * $8 * 100 = $52.47. Chargify is free for up to 50 customers; $49/mo for up to 500 customers, $249 for up to 5,000 customers and upward from there (source). For 100 customers, it would cost $49/mo. Total monthly expenses for Chargify, Authorize.net, and this merchant account is $49 + $30 + $52.47 = $131.47, or 16.43% of the revenue. About the same as Paypal + Recurly or Paypal + Spreedly. For an $8/mo subscription, you’re going to be paying 20% or more of your revenue to the payment processors until you reach 50-70 customers. That’s amazing to me. For this comparison, Chargify wins hands down when you don’t have many customers because their service is free up to 50 customers. The more customers you have, the closer the options become. 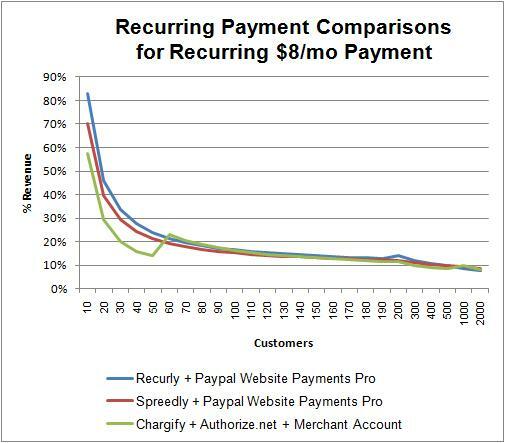 Also, remember that you don’t have to use Recurly or Spreedly with just Paypal Website Payments Pro — that’s just what I’m looking it; do you own calculations before making a decision. It’s also important to note that the difference isn’t that much when you work it out. For 2,000 customers, the difference is less than $150/mo, but when you consider that you’re making $16K/mo at that point, things like customer service, how easy their API is to use, and what features they offer become a lot more important than the price difference. Finally, if you notice any errors in these calculations, please let me know. Lean Designs, the HTML5 mockup tool I’ve been working on, is now jMockups due to trademark issues with “Lean Designs”. It’s coming along incredibly well and I expect to launch the alpha version in two to three weeks. If you’re interested in helping test it when its ready, add your email to the mailing list on the jMockups.com homepage. — Only show common groups of attributes when multiple elements are selected. For example, a text box might have font and border attributes. A picture wouldn’t have font attributes, but it would have a border. When you select both, the toolbar now only shows the common attributes (border in this example). — Also, if the element shares common values for a specific attribute (both border widths are 3px), the toolbar defaults to that value. If they are different, it doesn’t display a value for that attribute. — Changed the default toolbar positioning for selected objects. This has been a bit tricky. For example, you can say by default to show the toolbar to the left of a selected element, but what if that causes it to extend beyond the right border of the screen? You say, OK, then show it to the left of the element. OK, but what if the element spans the width of the screen? You get the idea–the new algorithm works fairly well, but will likely change as I get feedback from actual users. — You can now reposition the toolbar by dragging it around the screen. jMockups will also remember where you dropped it so when you select that element again, the toolbar will reappear in the same position. The position is also saved when you save the mockup so when you reload the page it remembers where it should appear.